Hold on to your rigs, kids: Dead Space 2 is coming to the PC. I liked Dead Space. It had crazy atmosphere, some fun startle moments and a story good enough that it was worth paying attention to. So when EA put the kibosh on the PC version of Dead Space 2, I was crestfallen. But I also noticed that it was still listed on GameStop and the EA Store and furthermore, EA has never actually said that it wouldn't release the game for the PC, just that it was currently focused on the 360 and PS3 versions. Theories of conspiracy took root in my brain! What was actually being conspired never really became clear but it doesn't matter now, because EA and Visceral Games have confirmed that Dead Space 2 is in fact coming to the PC. The information first came to light as part of EA's FY2011 release schedule, which listed the game for "Console, Handheld/Mobile, PC," and then, to soothe the fears of those who worried it might be an error, the Dead Space Twitter feed confirmed it. "Dead Space PC lovers can relax! Dead Space 2 is officially coming to PC," it said. "Sorry we couldn't talk about it before." No idea why it was so hush-hush until now (and believe me, I've asked and been ignored a few times since February) but really, as long as the game is coming, who cares? Of course, if I find out I'll let you know; in the meantime, keep your eyes on deadspace.ea.com for more information. 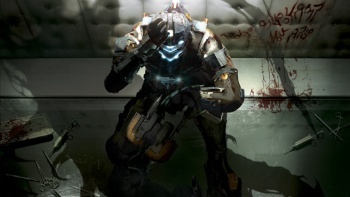 Dead Space 2 for the PC (and everything else) is currently slated to come out in early 2011.